The Fargo Public Library has added mobile wireless hotspots to its circulating collection to enable individuals and families to access needed digital resources. The library can help residents get connected whether they are doing homework, accessing the latest e-book or streaming movies at home or on the road. 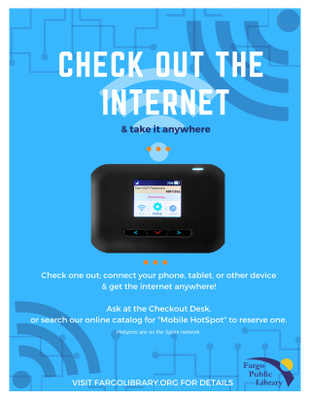 The hotspots can be checked out the same way as a book or DVD and will provide internet access from almost anywhere to any internet-enabled device, such as a smartphone, tablet or laptop. The library’s wireless mobile hotspots are available at all three library locations and can be checked out for up to three weeks. These hotspots may be renewed if there are no holds or requests for the item. Patrons must have a Fargo Public Library account in good standing to check out a wireless hotspot from the library. The wireless hotspots operate on the Sprint network. For more information or for help using the hotspots, ask a librarian at any of the library locations or email Ask Reference .